The grading A–C for each of the clinical recommendations has been applied according to the definitions used by the Scottish Intercollegiate Guidelines Network1 (see appendix I). ✔ Recommended best practice based on the clinical experience of the guideline development group, and appropriate for audit. those with worsening angina should be referred to and assessed by a specialist on the day of presentation. All patients should have a 12 lead ECG performed. Patients with persistent ST segment elevation or acute Q wave myocardial infarction, and those with alternative diagnoses, exit from this guideline and should be managed appropriately. Patients with a suspected acute coronary syndrome should be observed, with repeat 12 lead ECG recording, during symptoms if the opportunity arises. Blood samples for cardiac troponin (troponin T or I) should be taken a minimum of 12 hours after the onset of symptoms. New ischaemic changes on the ECG or elevation of troponin confirm the diagnosis (see table 1 and recommendation 5). the patient can be mobilised and discharged. Risk assessment with stress testing should be performed unless contraindicated, preferably before discharge from hospital. Patients with a confirmed acute coronary syndrome should be admitted to a cardiac care unit or high dependency unit with continuous ECG rhythm monitoring. If symptoms recur the 12 lead ECG should be repeated. Confirmed acute coronary syndrome. Patients who have had ischaemic ECG changes, or cardiac troponin release or raised CK-MB enzyme demonstrated at any time during admission, have a confirmed acute coronary syndrome. When free from symptoms and ischaemic ECG changes for > 48 hours, and any intravenous treatments and heparin have been stopped for > 24 hours, risk assessment with stress testing should be performed, unless contraindicated; stress testing for risk assessment is unnecessary if the patient is already in a high risk category for which coronary angiography is indicated. Patients with unstable angina or non-Q wave myocardial infarction should have their cardiac prognosis assessed by estimation of their risk of death or further cardiac events. In patients whose symptoms and condition have become stable after initial treatment, this assessment should include stress testing. Treatment should be directed at reducing their risk. Referral for coronary angiography. Patients with recurrent or refractory angina should be referred for coronary angiography with a view to myocardial revascularisation for relief of symptoms; these patients are also in a category at high risk of further cardiac events. Those patients with unstable angina or non-Q wave myocardial infarction whose condition has stabilised, but who are at high risk of death or further cardiac events, should be referred for coronary angiography. Low risk: If the cardiac troponin result is negative or low (troponin T < 0.01 μg/l or troponin I equivalent), and the stress test result indicates a low risk category, the patient can be discharged; if free from cardiac symptoms, no further cardiac interventions are necessary. Subsequent outpatient review is appropriate for further investigations to confirm or exclude a coronary diagnosis, and adjustment or cessation of drug treatment. Intermediate risk: Patients without high risk features, such as evidence of impaired left ventricular function, or haemodynamic abnormalities or arrhythmia during the acute phase, and who have either: • a normal cardiac troponin result (troponin T < 0.01 μg/l, or troponin I equivalent) and with a stress test indicating intermediate risk; or • moderately elevated cardiac troponin (troponin T 0.01 μg/l to 0.1 μg/l, or troponin I equivalent) and with a stress test result indicating a low risk category; are at an intermediate level of risk. Many cardiologists perform coronary angiography on patients in these categories of intermediate risk, and this practice has been recommended; but coronary angiography cannot be considered mandatory in the current absence of clear evidence that routine investigation of such patients results in an improved outcome. High risk: If the maximal cardiac troponin result is high (troponin T > 0.1 μg/l, or troponin I equivalent), or the stress test result indicates a high risk category, coronary angiography should be arranged, unless contraindicated, and performed urgently, before discharge from hospital. Those with acute ischaemia associated with hypotension, arrhythmia, or heart failure, are also in a high risk category and should be referred for coronary angiography. Patients unable to exercise: If the patient is unable to perform an exercise ECG, an alternative non-exercise (pharmacological) stress test, such as a stress echocardiograph or isotope myocardial stress perfusion study, should be arranged unless contraindicated; coronary angiography should be undertaken according to the risk category determined, if indicated as described above. If no stress test can be performed, and the maximal cardiac troponin result is intermediate or high, coronary angiography should be arranged, unless contraindicated. If no stress test can be performed, and if the troponin result is low and there are no further symptoms or ECG changes, the patient may be able to be discharged and reviewed in the outpatient clinic. All patients with a confirmed acute coronary syndrome should be given aspirin, unless contraindicated, as soon as the diagnosis is made; low dose aspirin once daily should be continued subsequently, unless contraindicated. Low molecular weight heparin should be given for at least two days, and for up to eight days or longer in cases of recurrent ischaemia or where myocardial revascularisation is delayed or contraindicated. To reduce their risk of infarction, all patients with a confirmed acute coronary syndrome should be treated with a β blocker without intrinsic sympathomimetic activity, and where there is no contraindication. Where there is a contraindication to the use of β blockers, a heart rate slowing calcium channel antagonist should be given to all patients with a confirmed acute coronary syndrome with no evidence of heart failure or left ventricular dysfunction to reduce their risk. Nitrates should be given to relieve pain or ischaemia in patients with an acute coronary syndrome; if further symptoms or ischaemia occurs, a calcium channel antagonist can be added to the β blocker. A potassium channel opener should be given in addition to nitrates and β blockers (or calcium channel antagonists) if there are recurrent symptoms or ischaemia. Treatment with an intravenous small molecule platelet glycoprotein IIb/IIIa inhibitor for up to 96 hours should be given to patients with an acute coronary syndrome at high risk of an adverse outcome. An intravenous platelet glycoprotein IIb/IIIa inhibitor should be administered to patients with an acute coronary syndrome with elevated cardiac troponin who are scheduled to undergo percutaneous coronary intervention using unfractionated heparin. This should be commenced before intervention. Recurrent or refractory acute coronary syndromes. Patients with a recurrent acute coronary syndrome (recurrent symptoms or ischaemic ECG changes despite aspirin and anti-ischaemic medical treatment), especially those who have cardiac troponin release demonstrated at any time during admission, should be referred, unless contraindicated, directly for inpatient coronary angiography and myocardial revascularisation. An intravenous platelet glycoprotein IIb/IIIa inhibitor should be administered, and low molecular weight heparin continued until angiography. Patients with a refractory acute coronary syndrome (ischaemic ECG ST segment changes despite aspirin, heparin and anti-ischaemic medical treatment) should have an intravenous platelet glycoprotein IIb/IIIa inhibitor administered, and be referred, unless contraindicated, directly for urgent inpatient coronary angiography and myocardial revascularisation. In patients with unstable angina or non-Q wave myocardial infarction in whom coronary artery bypass graft surgery is indicated, surgery should be delayed until medical stabilisation, if this can easily be achieved. Patients with unstable angina and left main stem stenosis or equivalent with evidence of myocardial ischaemia, or with triple vessel disease and impaired left ventricular function, should have coronary artery bypass graft surgery performed, unless the risk or prognosis from comorbidity would result in an unacceptably increased operative risk. Patients previously referred for and awaiting coronary artery bypass graft surgery who develop an unstable coronary syndrome should be given priority on waiting lists over those patients with stable angina, and have their CABG surgery expedited. It is important to treat hypertension and heart failure in patients with acute coronary syndromes. Patients with confirmed unstable angina or non-Q wave myocardial infarction should have advice on and management of their risk factors. Figure 1 shows a summary flow chart for management of patients with suspected acute coronary syndromes without ECG ST segment elevation. 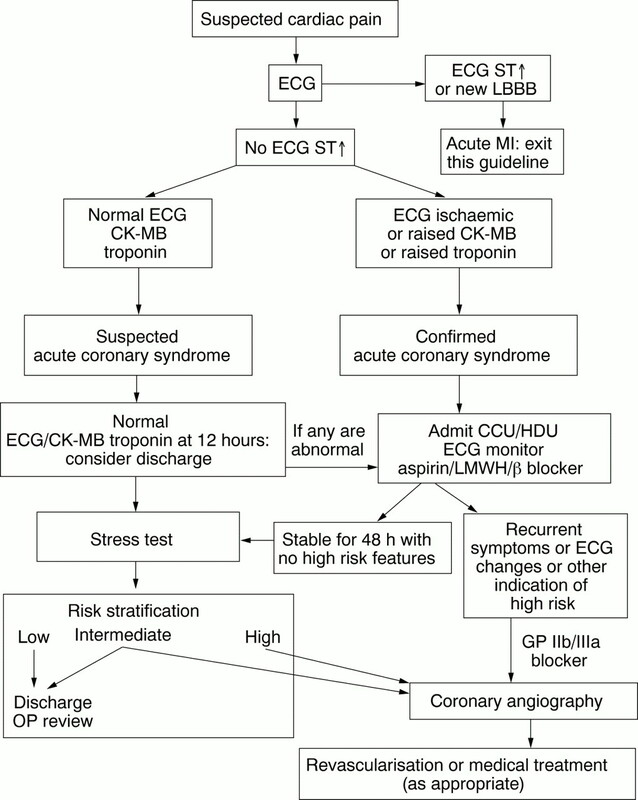 Summary flow chart for management of patients with suspected acute coronary syndromes without ECG ST segment elevation. Patients presenting with acute coronary syndromes, but without persistent ECG ST segment elevation, have unstable angina or non-Q wave myocardial infarction. They are estimated to account for at least 120 000 admissions to UK hospitals each year. Treatment can alleviate recurrent symptoms and ischaemia and improve prognosis, but clinical management has been reported to vary widely.2 The frequency of the condition, its potential for complications, the cost to the community and inconsistent management provide the justification for the production of this guideline. The guideline development group. This guideline was developed by a working group nominated by the Guidelines and Medical Practice Committee of the British Cardiac Society in collaboration with the Clinical Effectiveness and Evaluation Unit of the Royal College of Physicians (London). Members of the group represented interests from public health, primary care, district general hospitals (both cardiologists and general physicians) and tertiary centres, and advice was obtained from representatives of patient groups (appendix II). The guideline reflects the consensus of the group derived from presentations by five specialist reviewers on the following subjects: diagnosis and risk stratification, antithrombotic and anti-ischaemic treatment with drugs, angioplasty, and surgery. Literature search. The specialist reviewers carried out a review of their subject based on their own knowledge and an exhaustive search of the literature. Electronic searches of Medline and the Cochrane database, using the key words acute coronary syndromes, unstable angina or non-Q wave myocardial infarction, yielded over 5000 papers in peer review journals since 1986; and associated drug treatment, aspirin, heparin, low molecular weight heparin, glycoprotein IIb/IIIa antagonists, angioplasty, coronary artery bypass graft surgery yielded over 3000 papers. We have not attempted to perform a systematic review of the quality of individual studies included in published meta-analyses or systematic reviews. This guideline and the recommendations are based on evidence reviewed from the medical literature up to December 1999. Strength of evidence and grades of recommendations. The strength of evidence and the recommendations drawn from it were classified according to the definitions used by the Scottish Intercollegiate Guidelines Network,1 derived from the US Agency for Health Care Policy and Research3 (see appendix I). Scope of this guideline. The guideline is intended to improve the care of patients and is primarily for hospital doctors involved in the reception and management of patients presenting with a suspected acute coronary syndrome. Patients found to have persistent ECG ST segment elevation confirming an acute (potential Q wave) myocardial infarction, and those with a non-cardiac diagnosis, are excluded from this guideline when one of these diagnoses is established. The guideline is concerned with the initial diagnosis of acute coronary syndromes, assessment of patients and confirmation of the diagnosis, risk stratification, medical treatment, indications for coronary angiography, and the role of coronary angioplasty and surgery. It reflects the consensus of opinion of the working group, derived from the evidence, and is applicable to the majority of patients. Recommendations for investigations and treatments are made only where they can be justified on the basis of evidence of clinical benefit. The guideline does not preclude the use of alternative approaches in individual patients, and should not be used to override clinical judgement. It is accepted that resources may limit the use of expensive treatments, but this guideline has not attempted a cost-effectiveness analysis. It is recommended that this guideline should be used as a template to be adapted for local use. Date for review. Rapid advances in the management of patients with acute coronary syndromes have occurred in recent years, and major trials of drug and interventional treatment are expected to report soon. This guideline should be reviewed by January 2002. Acute coronary syndromes without ECG ST segment elevation result from the abrupt, total or subtotal, transient and typically recurrent obstruction of a coronary artery.4-7 They are caused, in most cases, by rupture or erosion of the cap of an atheromatous plaque with consequent platelet activation leading to obstruction of the vessel by various contributions from thrombus, vasoconstriction or spasm. Spontaneous lysis or fragmentation of the thrombus, or the relief of spasm, allows the ischaemia to resolve, but distal embolism may result in myocardial necrosis. Persistence of an occlusive thrombus leads, in the absence of effective collateral blood supply, to a fully developed infarction typically with Q waves on the ECG. Traditionally the diagnosis of unstable angina has required the exclusion of infarction. The use of sensitive markers of myocardial necrosis has shown that a continuum exists from myocardial ischaemia to non-Q wave infarction; thus, it is logical and practical to consider the diagnosis, investigation, and management of this continuum together as a single entity of acute coronary syndromes without ECG ST segment elevation. The management of acute coronary syndromes without ECG ST segment elevation is distinct from that of acute myocardial infarction with persistent ECG ST segment elevation. Diagnosis is based on the clinical history, the admission or subsequent 12 lead ECG, and cardiac enzymes or other markers in plasma (table 1).3 Various imaging tests can confirm myocardial perfusion or wall motion abnormalities. prolonged (> 15 minutes) angina occurring at rest. but should not show persistent acute ST segment elevation. The assessment of risk should be a continuous process. Patients in whom the diagnosis of unstable angina or non-Q wave myocardial infarction is confirmed are at heightened risk for an early coronary event; but all patients with coronary artery disease, including those in whom the diagnosis of an acute coronary syndrome is discounted, remain at some risk throughout their lives. One study has shown that in patients with suspected unstable angina, when both CK-MBmass and troponin I remain normal at 0, 4, and 8 hours after presentation, there is a favourable early (up to 24 hours) prognosis; the negative predictive value was 99% in excluding myocardial infarction or need for urgent myocardial revascularisation.33 Another study has shown that in patients presenting with suspected unstable angina and non-diagnostic ECGs, a normal resting myocardial isotope perfusion study is associated with a low risk.42 43 Such patients do not need admission to a coronary care unit. Recurrent acute coronary syndrome is defined as a recurrence of symptoms or ischaemic ECG changes despite treatment with aspirin and medical anti-ischaemic agents within two months of the diagnosis of a confirmed acute coronary syndrome. Refractory acute coronary syndrome is defined as a recurrence of symptoms and ischaemic ECG ST segment changes despite treatment with aspirin, heparin, and medical anti-ischaemic agents. Subcutaneous low molecular weight heparin is easier to administer than intravenous unfractionated heparin, has more consistent antithrombin effects, has no need for routine anticoagulant monitoring, and has a similar safety profile. Platelet glycoprotein IIb/IIIa receptor blockers: Intravenous treatment with a platelet glycoprotein IIb/IIIa receptor blocker reduces the risk of complications in patients with unstable angina or non-Q wave myocardial infarction treated with aspirin and unfractionated heparin.63 The greatest benefit, in terms of the number of patients needed to treat to avoid one complication, is in those at high risk such as cardiac troponin release positive, ischaemic ECG ST segment depression, refractory unstable angina, or undergoing invasive percutaneous coronary intervention.64-68 Meta-analyses show that the principal effect is a reduction in the risk of myocardial infarction, but there is also evidence of reduction in mortality as well.63 69 The three currently available agents are abciximab, tirofiban, and eptifibatide.70 71 Abciximab is a monoclonal antibody, whereas tirofiban and eptifibatide are small molecules and thus more suitable for repeated intravenous administration. All have been shown to be effective, but no direct comparisons between agents have been made. Currently, trials of efficacy of platelet glycoprotein IIb/IIIa receptor blockers on patients also receiving low molecular weight heparin have not been reported. Platelet glycoprotein IIb/IIIa receptor blockers are not indicated for unselected use in all patients with acute coronary syndromes; such agents should be used in those at high risk of an adverse event, or undergoing percutaneous coronary intervention. Medical treatment for relief of symptoms: Medical treatment can relieve symptoms and myocardial ischaemia in patients with acute coronary syndromes. In several observational studies of patients with unstable angina, intravenous administration of nitrates has been shown to relieve chest pain and ischaemia.76-81 There is no evidence that administration by intravenous infusion is more efficacious than equipotent doses of long acting nitrates given by other routes82-84; but titration of dose may be quicker and easier to manage with intravenous administration. Medical treatment for prognostic benefit: A meta-analysis of four studies of 4700 patients with unstable angina demonstrated a 13% reduction in the risk of developing myocardial infarction among patients treated with β blockers.91 There is some evidence that diltiazem is associated with a reduction in reinfarction, not mortality, after non-Q wave myocardial infarction, but only in those patients with preserved left ventricular function92-94; similar findings have been reported with verapamil.95 In subgroup analysis of another study, verapamil given after myocardial infarction to those patients without heart failure was associated with a lower mortality.96 There is no evidence that nitrate drugs, the dihydropyridine group of calcium channel antagonists, or potassium channel openers are beneficial in reducing mortality or the risk of myocardial infarction in patients with unstable angina. The two trials comparing surgical with medical treatment carried out in the 1970s showed no overall reduction in mortality or rates of infarction in the surgical group.100-104 Both trials demonstrated improved survival for patients with obstructive left main stem disease, or with obstructive three vessel coronary artery disease associated with moderately impaired left ventricular function; these results are consistent with the meta-analysis of the surgical trials performed in patients with chronic stable coronary artery disease.105 There have been improvements in surgical and anaesthetic techniques since these trials were conducted; and both trials were carried out before the introduction of currently used treatments with aspirin, low molecular weight heparin, platelet glycoprotein IIb/IIIa receptor antagonists, or the statin lipid lowering agents. A number of studies (FRISC II and TIMI IIIB) have suggested that coronary artery bypass graft surgery carried out urgently for unstable angina can be performed with low mortality106 110; however, this is not supported by data from large registries in both the UK and USA.100 104 105 115 116 120-122 The indications from the two randomised studies of an overall benefit from an early invasive approach would not be expected in general clinical practice unless surgery for unstable angina can be performed with an operative mortality at a lower level than is currently being achieved. meticulous control of blood pressure and glucose in people who also have diabetes. The National Service Framework for Coronary Heart Disease 126 has advised that patients who have had an acute cardiac event should be referred for cardiac rehabilitation. We believe that all confirmed acute coronary syndromes are acute cardiac events. Evidence obtained from meta-analysis of randomised controlled trials. Evidence obtained from at least one randomised controlled trial. Evidence obtained from at least one other type of well designed, quasi-experimental study. Evidence obtained from well designed, non-experimental descriptive studies, such as comparative studies, correlation studies, and case studies. Requires at least one randomised controlled trial as part of a body of literature of overall good quality and consistency addressing the specific recommendation (evidence levels Ia , Ib ). Requires the availability of well conducted clinical studies but no randomised clinical trials on the topic of recommendation (evidence levels IIa , IIb , III ). Requires evidence obtained from expert committee reports or opinions and/or clinical experiences of respected authorities. Indicates an absence of directly applicable clinical studies of good quality (evidence level IV ). Scottish Intercollegiate Guidelines Network (SIGN). http://www.sign.ac.uk. (1998) Organisation to Assess Strategies for Ischaemic Syndromes (OASIS) Registry Investigators. Variations between countries in invasive cardiac procedures and outcomes in patients with suspected unstable angina or myocardial infarction without initial ST elevation. Lancet 352:507–514, . Braunwald E, Mark DB, Jones RH, et al. Unstable angina: diagnosis and management. Clinical Practice Guideline No 10. Rockville, Maryland: Agency for Health Care Policy and Research, National Heart, Lung and Blood Institute, Public Health Service, US Department of Health and Human Services, AHCPR Publication number 94–0602, March 1994. Accessed at:http://www.ahcpr.gov/clinic/, http://text.nlm.nih.gov/tempfiles/is/tempD136187.html. (1997) New insights into the pathogenesis and prevention of acute coronary syndromes. Am J Cardiol 79(12B):17–23, . (1988) Insights into the pathogenesis of acute ischemic syndromes. Circulation 77:1213–1220, . (1997) Insights into the pathophysiology of unstable coronary artery disease. Am J Cardiol 80(5A):5E–9E, . (1985) Plaque fissuring: the cause of acute myocardial infarction, sudden death and unstable angina. Br Heart J 53:363–373, . (1995) Preinfarction angina as a major predictor of left ventricular function and long-term prognosis after a first Q wave myocardial infarction. J Am Coll Cardiol 26:319–327, . (1996) A comparison of recombinant hirudin with heparin for the treatment of acute coronary syndromes. N Engl J Med 335:775–782, (R). (1994) Effects of tissue plasminogen activator and a comparison of early invasive and conservative strategies in unstable angina and non-Q-wave myocardial infarction. Results of the TIMI IIIB trial thrombolysis in myocardial ischemia. Circulation 89:1545–1556, (R). (1996) Low-molecular-weight heparin during instability in coronary artery disease. Lancet 347:561–568, (R). (1997) Comparison of low-molecular-weight heparin with unfractionated heparin acutely and with placebo for 6 weeks in the management of unstable coronary artery disease. Fragmin in unstable coronary artery disease study (FRIC). Circulation 96:61–68, (R). (1989) Unstable angina. A classification. Circulation 80:410–414, . (1996) Early continuous ST segment monitoring in unstable angina: prognostic value additional to the clinical characteristics and the admission electrocardiogram. Heart 75:222–228, . (1998) Long-term prognosis in unstable angina. The importance of early risk stratification using continuous ST segment monitoring. Eur Heart J 19:240–249, . (1992) The prognostic value of serum troponin T in unstable angina. N Egl J Med 327:262–264, . (1996) Prospective study of the role of cardiac troponin T in patients admitted with unstable angina. BMJ 313:262–264, . (1997) The role of cardiac troponin T and other new biochemical markers in evaluation and risk stratification of patients with acute chest pain syndromes. Clin Cardiol 20:934–942, . (1997) Applicability of cardiac troponin T and I for early risk stratification in unstable coronary disease. Circulation 96:2578–2585, for the TRIM Study Group, . (1997) Emergency room triage of patients with acute chest pain by means of rapid testing for troponin T or I. N Engl J Med 337:1648–1653, . (1996) Cardiac troponin T levels for risk stratification in acute myocardial ischemia. N Engl J Med 335:1333–1341, for the GUSTO-IIa Investigators, . (1996) Cardiac-specific troponin levels to predict the risk of mortality in patients with acute coronary syndromes. N Engl J Med 335:1342–1349, . (2000) The TIMI risk score for unstable angina/non-ST elevation MI: a method for prognostication and therapeutic decision making. JAMA 284:835–842, . (1998) Prognosis of medically stabilized unstable angina pectoris with a negative exercise test. Am J Cardiol 82:662–665, . (1992) Unstable angina outcomes according to clinical presentation. J Am Coll Cardiol 19:1659–1663, . (1993) Very early risk stratification by electrocardiogram at rest in men with suspected unstable coronary heart disease. The RISC study group. J Intern Med 234:293–301, . (1997) Non-invasive risk stratification within 48 hours of hospital admission in patients with unstable coronary artery disease. Eur Heart J 18:780–788, . (1999) Relative contributions of a single admission 12-lead electrocardiogram and early 24-hour continuous electrocardiograph monitoring for early risk stratification in patients with unstable coronary artery disease. Am J Cardiol 83:667–674, . (1999) Prognostic value of the admission electrocardiogram in acute coronary syndromes. JAMA 281:707–713, . (1994) The prognostic value of C-reactive protein and serum amyloid A protein in severe unstable angina. N Engl J Med 331:417–424, . (1998) Incremental prognostic value of serum levels of troponin T and C-reactive protein on admission in patients with unstable angina pectoris. Am J Cardiol 82:715–719, . (1998) Prognostic role of troponin T versus troponin I in unstable angina perctoris for cardiac events with meta-analysis comparing published studies. Am J Cardiol 81:1405–1410, (M). (1999) Utility of cardiac troponin I, creatine kinase-MBmass, myosin light chain 1, and myoglobin in the early in-hospital triage of “high risk” patients with chest pain. Heart 82:614–620, . (1998) A clinical trial of a chest pain observation unit for patients with unstable angina. N Engl J Med 339:1882–1888, (R). (1997) Costs of an emergency department-based diagnostic protocol vs hospitalisation in patiens with chest pain. A randomised controlled trial. JAMA 278:1670–1676, (R). (1996) An emergency department-based protocol for rapidly ruling out myocardial ischemia reduces hospital time and expense: results of a randomized study (ROMIO). J Am Coll Cardiol 28:25–33, (R). (1994) Cost-effectiveness of a new short-stay unit to “rule out” acute myocardial infarction in low risk patients. J Am Coll Cardiol 24:1249–1259, . (1993) Emergency cardiac stress testing in the evaluation of emergency department patients with atypical chest pain. Ann Emerg Med 22:794–798, . (1998) A ‘same day’ direct-access chest pain clinic: improved management and reduced hospitalization. QJM 91:333–337, . (1998) Outcome from a rapid-assessment chest pain clinic. QJM 91:339–343, . (2000) Should we establish chest pain observation units in the UK? A systematic review and critical appraisal of the literature. J Accid Emerg Med 17:1–6, (S). (1997) Long-term (10 years) prognostic value of a normal thallium-201 myocardial exercise scintigraphy in patients with coronary artery disease documented by angiography. Eur Heart J 18:69–77, . (1998) Clinical value of acute rest technetium-99m tetrofosmin tomographic myocardial perfusion imaging in patients with acute chest pain and nondiagnostic electrocardiograms. J Am Coll Cardiol 31:1011–1017, . (1997) Risk stratification in unstable coronary artery disease. Additive value of troponin T determinations and predischarge exercise tests. Eur Heart J 18:762–770, . and the FRISC Study Group. (1994) Prognostic significance of a fixed thallium defect one to six months after onset of acute myocardial infarction or unstable angina. Multicentre myocardial ischemia research group. Am J Cardiol 74:1196–1200, . (1994) Dipyridamole technetium 99m sestamibi myocardial tomography as an independent predictor of cardiac event-free survival after ischaemic events. J Nucl Cardiol 1:72–82, . (1995) Exercise technetium-99m myocardial tomography for the risk stratification of men with medically treated unstable angina pectoris. Am J Cardiol 76:236–240, . (1995) Prognostic value of predischarge dipyridamole technetium sestamibi myocardial tomography in medically treated patients with unstable angina. Am Heart J 130:734–740, . (2000) Selection bias in the management of unstable angina. J R Coll Physic 34:179–184, . (1995) Incidence and follow-up of Braunwald subgroups in unstable angina pectoris. J Am Coll Cardiol 25:1286–1292, . (1998) Risk stratification of patients with medically treated unstable angina using exercise echocardiography. Am J Cardiol 82:720–724, . (1999) ACC/AHA guidelines for coronary angiography: a report of the American College of Cardiology/American Heart Association task force on practice guidelines (committee on coronary angiography). J Am Coll Cardiol 33:1756–1824, (71–0163) http://www.americanheart.org/scientific/statements/1999/0599b. (1994) Collaborative overview of randomised trials of antiplatelet therapy - I: prevention of death, myocardial infarction, and stroke by prolonged antiplatelet therapy in various categories of patients. BMJ 308:81–106, (M) (S). (1993) Aspirin versus heparin to prevent myocardial infarction during the acute phase of unstable angina. Circulation 88:2045–2048, (R). (1988) Aspirin, heparin, or both to treat acute unstable angina. N Engl J Med 319:1105–1111, (R). (1996) Adding heparin to aspirin reduces the incidence of myocardial infarction and death in patients with unstable angina. A meta-analysis. JAMA 276:811–815, (M) (S). (1997) A comparison of low-molecular weight heparin with unfractionated heparin for unstable coronary artery disease. N Engl J Med 337:447–452, for the Efficacy, and Safety of Subcutaneous Enoxaparin in Non-Q-wave Coronary Events (ESSENCE) Study Group, (R). (1999) Enoxaparin prevents death and cardiac ischemic events in unstable angina/non-Q-wave myocardial infarction. Results of the Thrombolysis in myocardial infarction (TIMI) 11b trial. Circulation 100:1593–1601, (R). (1999) Assessment of the treatment effect of enoxaparin for unstable angina/non-Q-wave myocardial infarction. TIMI 11b-ESSENCE meta-analysis. Circulation 100:1602–1608, (M). (1999) Comparison of two treatment durations (6 days and 14 days) of a low molecular weight heparin with a 6-day treatment of unfractionated heparin in the initial management of unstable angina or non-Q-wave myocardial infarction: FRAXIS (fraxiparine in ischaemic syndrome). Eur Heart J 20:1553–1562, (R). (1999) Long-term low-molecular-weight heparin in unstable coronary artery disease. FRISC II prospective randomised multicentre study. Lancet 354:701–707, (R). (2000) Unfractionated heparin and low-molecular-weight heparin in acute coronary syndrome without ST elevation: a meta-analysis. Lancet 355:1936–1942, (S) (M). (1998) Clinical outcomes of therapeutic agents that block the platelet glycoprotein IIb/IIIa integrin in ischemic heart disease. Circulation 98:2829–2835, (S). (1997) Platelet glycoprotein IIb/IIIa receptor blockade and low-dose heparin during percutaneous coronary revascularisation. N Engl J Med 336:1689–1696, (R). (1994) Use of a monoclonal antibody directed against the platelet glycoprotein IIb/IIa receptor in high risk coronary angioplasty. N Engl J Med 330:956–961, (R). (1997) Randomised placebo-controlled trial of abciximab before and during coronary intervention in refractory unstable angina: the CAPTURE study. Lancet 349:1429–1435, (R). (1999) Troponin concentrations for stratification of patients with acute coronary syndromes in relation to therapeutic efficacy of tirofiban. Lancet 354:1757–1762, for the PRISM investigators, (R). (1999) Benefit of abciximab in patients with refractory unstable angina in relation to serum troponin T levels. N Engl J Med 340:1623–1629, for the CAPTURE Study Investigators, (R). (1999) Platelet glycoprotein IIb/IIIa receptor inhibition in non-ST-elevation acute coronary syndromes: early benefit during medical treatment only, with additional protection during percutaneous coronary intervention. Circulation 100:2045–2048, (M). (1998) An overview of the results of clinical trials with glycoprotein IIb/IIIa inhibitors. Eur Heart J 19 (suppl D) D10–D21, (S). (1999) Comparing trials of glycoprotein IIb/IIIa receptor antagonists. Eur Heart J 20 (suppl R) R10–R17, (S). (1988) Randomised trial of intravenous streptokinase, oral aspirin, both or neither among 17,187 cases of suspected acute myocardial infarction: ISIS-2. Lancet ii:349–360, (R). (1994) Indications for fibrinolytic therapy in suspected acute myocardial infarction: collaborative overview of early mortality and major morbidity results from all randomised trials of more than 1000 patients. Lancet 343:311–322, (M) (S). (1993) Patients with suspected myocardial infarction who present with ST depression. Lancet 342:1204–1207, (R). (1993) Thrombolytic therapy for unstable angina. Clin Cardiol 16:637–641, (R). (1982) Intravenous nitroglycerin in refractory unstable angina pectoris. Aust NZ J Med 12:598–602, . (1982) Intravenous nitroglycerin for rest angina: potential pathophysiologic mechanisms of action. Arch Intern Med 142:1806–1809, . (1983) Intravenous nitroglycerin for the treatment of angina at rest not responsive to standard nitrate therapy. Am J Cardiol 51:694–698, . (1981) Intravenous nitroglycerin in unstable angina. in Nitrates III: cardiovascular effects. eds Lechtlen PR, Engel H (Springer-Verlag, Berlin), pp 371–376, . (1980) Relief of refractory angina with continuous intravenous infusion of nitroglycerin. Chest 77:375–379, . (1982) Limitations of continuous intravenous nitroglycerin in patients with refractory angina at rest. Circulation 66 (suppl II) II-120, . (1981) Intravenous nitroglycerin for spontaneous angina: a short term, prospective, randomised trial [abstract]. Circulation 64:IV-10, . (1983) Intravenous nitroglycerin in the treatment of spontaneous angina pectoris: a prospective randomised trial. Circulation 67:276–282, (R). (1991) Buccal versus intravenous nitroglycerin in unstable angina pectoris. Eur J Clin Pharmacol 41:5–9, (R). (1984) Nifedipine and conventional therapy for unstable angina pectoris: a randomised, double-blind comparison. Circulation 69:728–739, (R). (1986) Early treatment of unstable angina in the coronary care unit: a randomised, double-blind, placebo controlled comparison of recurrent ischemia in patient treated with nifedipine or metoprolol or both. Br Heart J 73:331–337, (R). (1986) Effect of the addition of propranolol to therapy with nifedipine for unstable angina pectoris. A randomised, double-blind, placebo controlled trial. Circulation 73:331–337, (R). (1983) Comparison of short-term efficacy of diltiazem and propranolol in unstable angina at rest—randomised trial in 70 patients. Eur Heart J 4:69–98, (R). (1982) Nifedipine in unstable angina: a double-blind randomised trial. N Engl J Med 306:885–889, (R). (1999) Cardioprotection by opening of the KATP channel in unstable angina. Is this a clinical manifestation of myocardial preconditioning? Results of a randomised study with nicorandil. Eur Heart J 20:51–57, (R). (1988) Overview of results of randomised clinical trials in heart disease. II. Unstable angina, heart failure, primary prevention with aspirin, and risk factor modification. JAMA 260:2259–2263, (M) (S). (1986) Diltiazem and reinfarction in patients with non-Q wave myocardial infarction: Results of a double-blind, randomised, multicenter trial. N Engl J Med 315:423–429, (R). (1988) The effect of diltiazem on mortality and reinfarction after myocardial infarction. N Engl J Med 319:385–392, (R). (1991) Diltiazem increases late-onset congestive heart failure in post infarction patients with early reduction in ejection fraction. Circulation 83:52–60, . (1996) A controlled trial of verapamil in patients after acute myocardial infarction: results of the calcium antagonist reinfarction Italian study (CRIS). Am J Cardiol 77:421–422, (R). (1990) Effect of verapamil on mortality and major events after acute myocardial infarction (the Danish verapamil infarction trial II—DAVIT II). Am J Cardiol 66:779–785, (R). (1999) ACC/AHA guidelines for coronary artery bypass graft surgery: executive summary and recommendations: a report of the American College of Cardiology/American Heart Association task force on practice guidelines (committee to revise the 1991 guidelines for coronary artery bypass graft surgery). Circulation 100:1464–1480, (71–0174). Accessed at: http://www.americanheart.org/scientific/statements, http://circ.ahajournals.org/cgi/content/full/100/13/1464. (1995) A meta-analysis of randomized trials comparing coronary artery bypass grafting with percutaneous transluminal coornary angioplasty in multivessel coronary artery disease. Am J Cardiol 76:1025–1029, (M). (1995) Meta-analysis of randomised trials comparing coronary angioplasty with bypass surgery. Lancet 346:1184–1189, (M). (1987) Comparison of medical and surgical treatment for unstable angina pectoris. Results of a Veterans Administration co-operative study. N Engl J Med 316:977–984, (R). (1989) Medical compared with surgical management of unstable angina. 5 year mortality and morbidity in the Veterans Administration study. Circulation 80:1176–1189, (R). (1988) Veterans Administration co-operative study for treatment of patients with unstable angina. Results in patients with abnormal left ventricular function. Circulation 78:I113–I121, (R). (1991) Coronary artery surgery improves survival in high-risk unstable angina. Results of a Veterans Administration co-operative study with an 8 year follow-up. Veterans Administration co-operative study group. Circulation 84:II1260–II1267, . (1978) Unstable angina pectoris: national co-operative study group to compare surgical and medical therapy. Am J Cardiol 42:839–848, . (1985) Determinants of operative mortality and long term survival in patients with unstable angina. J Thorac Cardiovasc Surg 89:683–688, . (1995) One year results of the thrombolysis in myocardial infarction (TIMI) IIIb trial: a randomised comparison of tissue-type plasminogen activator versus placebo and early invasive versus early conservative management strategies in unstable angina and non-Q-wave myocardial infarction. J Am Coll Cardiol 26:1643–1650, (R). (1998) Outcomes in patients with acute non-Q-wave myocardial infarction randomly assigned to an invasive as compared with a conservative management strategy. Veterans Affairs non-Q-wave infarction strategies in hospital (VANQUISH) trial investigators. N Engl J Med 338:1785–1792, (R). (1998) A prospective randomised trial of triage angiography in acute coronary syndromes ineligible for thrombolytic therapy. Results of the medicine versus angiography in thrombolytic exclusion (MATE) trial. J Am Coll Cardiol 32:596–605, (R). (1999) Invasive versus conservative management of unstable angina and non-Q-wave myocardial infarction: a meta-analysis. Circulation 100:I-775, (M). (1999) Invasive compared with non-invasive treatment in unstable coronary artery disease: FRISC II prospective randomised multi-centre study. Lancet 354:708–715, (R). (1999) An early invasive strategy is associated with decreased mortality: GUSTO IIb trial. Circulation 100:I-359, . (1999) Contemporary approach to management of unstable angina [editorial] Lancet 354:694–695, . (2000) Management of unstable coronary artery disease [letter]. Lancet 355:572, . (1996) Normal coronary angiograms: financial victory from the brink of clinical defeat? Heart 75:623–625, . (2000) Limitations of the Parsonnet score for measuring risk stratified mortality in the north west of England. Heart 84:71–78, . (1995) Multi-centre validation of a risk index for mortality, intensive care unit stay, and overall hospital length of stay after cardiac surgery. Circulation 91:677–684, . (1996) A model that predicts morbidity and mortality after coronary artery bypass graft surgery. J Am Coll Cardiol 28:1147–1153, . (1989) A method of uniform stratification of risk for evaluating the results of surgery in acquired adult heart disease. Circulation 79 (suppl I) I3–12, . (1997) Assessing the outcome of coronary artery bypass graft surgery: how many risk factors are enough. J Am Coll Cardiol 30:1317–1323, . (1994) Coronary artery bypass grafting: the Society of Thoracic Surgeons National Database Experience. Ann Thorac Surg 57:12–19, . (1990) Initial report of the Veterans Administration preoperative risk assessment study for cardiac surgery. Ann Thorac Surg 50:12–28, . (1999) Death on the waiting list for coronary artery surgery. Heart 81:564, . (1999) Waiting time and prioritisation for coronary artery bypass surgery in New Zealand. Heart 81:586–592, . (1992) Determinants for early mortality in patients awaiting coronary artery bypass graft surgery: a case control study. Eur Heart J 13:238–242, . National Service Framework for Coronary Heart Disease, 2000. http://www.doh.gov.uk/nsf/coronary.htm. (1998) Joint British recommendations on prevention of coronary heart disease in clinical practice. Heart 80 (suppl 2) S1–29, on behalf of the Societies, . (1999) British Hypertension Society guidelines for hypertension management 1999: a summary. BMJ 319:630–635, . (1999) Guidelines for management of hypertension: Report of the Third Working Party of the British Hypertension Society. J Human Hypertens 13:569–592, . A Powerpoint presentation slide kit of this Guideline, which can be downloaded for educational use for learning, teaching, and training, is available on the British Cardiac website. This guideline was developed at a workshop held on 7 October 1999 at the British Cardiac Society. The audit office of the British Cardiac Society administered the workshop for the preparation of this guideline, and has received funding from the National Institute for Clinical Excellence. The views expressed are those of the authors and not necessarily those of NICE.